Rep. Alan Grayson said GOP health care plan calls for sick to "die quickly"
Pelosi says GOP regularly makes statements on House floor "that relate to death"
WASHINGTON (CNN) -- House Speaker Nancy Pelosi ripped congressional Republicans on Thursday for holding Democrats to a higher standard in the rhetoric employed in the often acidic health care debate. 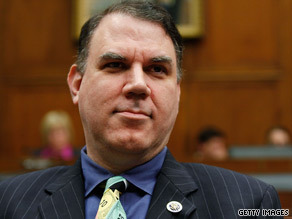 Rep. Alan Grayson isn't backing down from his controversial remarks made on the House floor. "Apparently, Republicans are holding Democrats to a higher level than they hold their own members," she said on Capitol Hill. "If anybody's going to apologize, everybody should apologize." Pelosi made her remarks after being asked to comment on a controversial speech made this week by Florida Democratic Rep. Alan Grayson, who said on the House floor that Republican health care plans call for sick people to "die quickly." "I apologize to the dead and their families that we haven't voted sooner to end this holocaust in America," he said. Grayson cited a Harvard University study released this month that said 44,000 Americans die each year because they have no health insurance. That prompted a spokesman for the National Republican Congressional Committee to issue a stinging rebuke, saying Grayson is "doubling down on his despicable remarks, and he is dragging his party with him." On Thursday, a GOP legislative leader from Grayson's home state of Florida criticized him for making light of the Jewish Holocaust during World War II. "Regardless of one's position on the issue of health care reform, comparing the American health care system to the systematic murdering of over 6 million Jews is totally outrageous and unfit for someone holding public office," Florida House Majority Leader Adam Hasner said. "Congressman Grayson should apologize to the Jewish community and the families of those whose loved ones were brutally executed. I'd also encourage Mr. Grayson to take a walk tomorrow afternoon to the U.S. Holocaust Museum so he can witness for himself just how offensive and inappropriate his statement is." Pelosi in turn argued that Republicans regularly make statements about health care on the House floor "that relate to death." The "points have been made," she said. "Now it's time for us to keep the focus on health care." Grayson, a Democrat who represents a central Florida swing district that includes Orlando, defended his recent remarks Wednesday on CNN's "The Situation Room." "What I mean is, they have got no plan," Grayson told Wolf Blitzer. "It's been 24 hours since I said that. Where is the Republican plan? We're all waiting to see something that will take care of the pre-existing conditions, to take care of the 40 million Americans who have no coverage at all. "That's what I meant when I said that the Republican plan is 'don't get sick. And if you do get sick, die quickly.' "
Grayson said the Republicans who he believes are obstructing health care reform are "foot-dragging, knuckle-dragging Neanderthals." Calling for universal health care, he slammed "whoever it is that's causing the Republicans to fight tooth-and-nail against anything, absolutely anything." "Those are the people who are really disserving Americans," he said.